It's our goal to make you more efficient and productive everyday as you collaborate with your team. While many of our enhancements are focused on improving the quality of that experience, we also want to give you peace of mind as you use Notejoy. 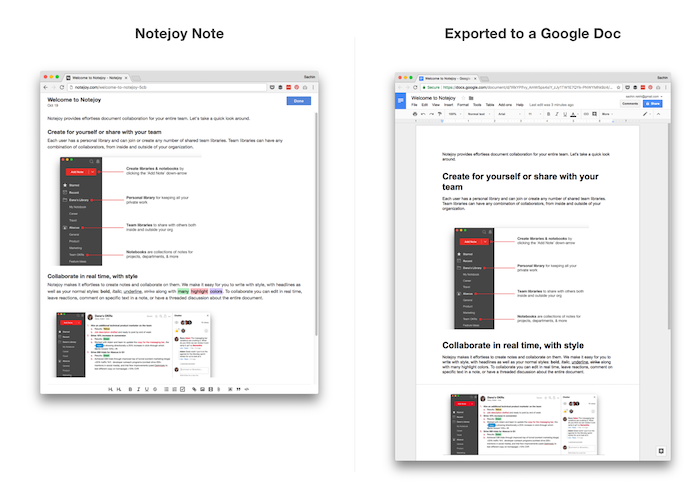 Today we are introducing the ability to export all your notes to Google Drive, ensuring that as you use Notejoy for your team, you always have the option to take your notes out whenever you'd like. The new export notes functionality allows you to pick a Notejoy library or notebook and have it exported to a Google Drive folder. Each of your notes will automatically be converted to a Google Document, preserving all your text, images, formatting, and styles. From Google Drive, you can easily convert the exported notes to other file formats, including Microsoft Word, OpenDocument Format, or Rich Text Format files. To access the export notes feature, visit your Account Settings.